To keep your deck looking its finest, protect it by cleaning and sealing your deck regularly and applying the best deck stain for the look you want. Staining helps prevent cracking and protects the wood from exposure to the elements. Stains come in an assortment of opacities. Some are oil-based and others water-based. 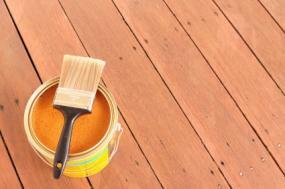 The more pigment added to your stain, the less you'll see your decking's natural wood. Oil-based stains are one of the more traditionally used products for staining a deck. Water-based stains are a newer product that don't promote mold growth the way that oil-stains can. Decks are often subjected to intense environmental conditions. Stained deck surfaces often need to be retreated every two to three years. If your deck is exposed to direct sunlight, cool damp shade or experiences heavy foot traffic be sure to inspect it each year. Taking care of your deck will add longevity to your finish.